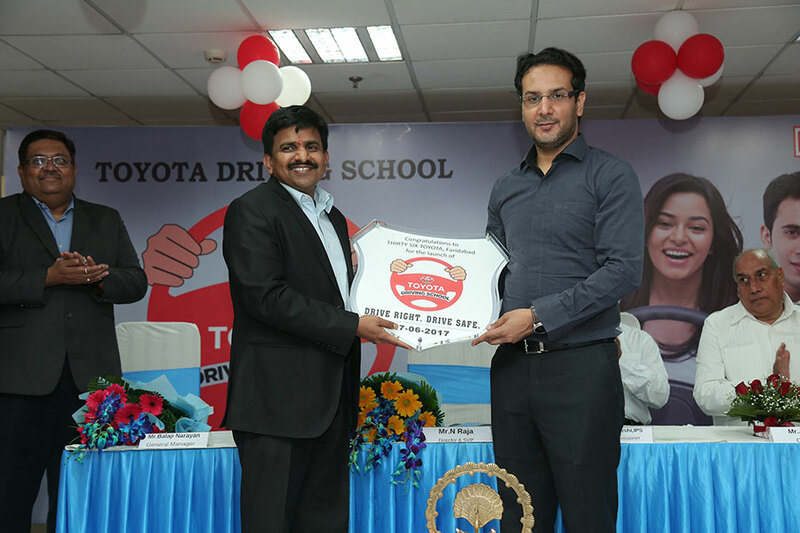 Toyota Kirloskar Motor (TKM) today announced the launch of the company’s first “Toyota Driving School” in National Capital Region at Faridabad in pursuance of its safety mission of ‘Safest Car with Safest Driver’. Managed by one of the Toyota’s dealerships – Thirty Six Toyota, this is the company’s first Driving School in Faridabad and Sixth in India. Present at the occasion were Dr. Hanif Qureshi, IPS – Commissioner of Police (Faridabad), Mr. Ashutosh Rajan, Secretary , Regional Transport Authority (RTA), Faridabad, Mr. Chander Shekar Nagar, Dealer Principal – Thirty Six Toyota and Mr. N Raja, Director & Senior Vice President (Marketing and Sales) – Toyota Kirloskar Motor. In line with company’s safety mission, Toyota Kirloskar Motor has launched five other driving schools across India in Kochi, Lucknow, Hyderabad, Chennai and Kolkata to improve safety culture in the country. As a part of company’s vision of “Safest Car with Safest Driver”, ‘Toyota Driving School’, one of its kind in the country, will ensure extreme importance on making every student a responsible and safe driver. The curriculum will be a comprehensive driver training program that will boast of high quality and practical and futuristic training models like the driver simulator mechanism which is expected to deliver the “Etios Experience”. To make this experience as realistic as possible, Toyota has incorporated features like IP, steering, and seats of an actual Etios car. We are proud to associate with Toyota Kirloskar Motor in contributing towards improving road safety in NCR. Increasing population and rising traffic in urban areas has compromised road safety. We believe that Toyota Driving School with Toyota’s world-class know-how, professional trainers and a comprehensive curriculum, will be able to inculcate a safer and cautious driving behavior amongst the people in our city. We are delighted to launch our first driving school in the NCR region at Faridabad reiterating our commitment towards road safety. The NCRB (National Crime Records Bureau) report has revealed that on an average, 17 people are killed in road accidents each and every hour and primary reason of road accidents are poor road safety practices. As safety leaders in the industry, it is our primary mission to ensure safest cars with safest drivers in the country and significantly reduce the traffic accidents with our safety initiatives. It is not “just another driving school” for getting a driving license, but it’s much more of a place that follows a comprehensive approach ensuring that every single student becomes a responsible driver on road and a safety ambassador in creating a safe road for everyone to use. We would like to thank our dealer partner – Thirty six Toyota, who has partnered with us in setting up this state-of-the art driving school infrastructure in Faridabad. We are confident that our Toyota Driving School will set a new standard for quality driving and traffic safety. I would also like to take this opportunity to invite each one of you to join us in raising awareness on road safety and educating your friends and family to help increase safe behavior. With the launch of Toyota Driving School across India, the company aims to bring down the rising number of road accidents caused majorly due to human error. The training module will integrate technical expertise along with enhancing behavioral skills to create awareness about safety nationwide. Toyota Driving School has till date enrolled 2000 plus students & looks forward to double it in 2017. By 2020 we plan to cross 50 such schools across India, voicing our traffic safety commitment, louder. We will be launching another five driving schools across India by 2017 and train around 5000 students to be a highly skilled driver and safety ambassador. To ensure safest drivers on Indian roads, TKM has been conducting similar Driver Training Programs & Health Check Up camp for Airport taxi drivers in Hyderabad, Bangalore and Delhi International Airport since 2014 as part of the CSR Initiatives on road safety awareness with over 6000 drivers participating in the campaign till date. Through this initiative Toyota aims at creating a strong road safety sense amongst the drivers, and encourage them to adopt safer driving practices. Safest Cars: Etios was first in its segment to standardize Air bags in driver and passenger side. The company went to set a safety benchmark with “The New Platinum Etios’, being the first in the industry to standardize Anti-Lock Braking System with Electronic Brake-force Distribution across all Toyota models & in all grades. Additionally, there are also new dual ISOFIX child seat locks for all models & all grades, added to ensure safety of children. Testament to its position as one of the segment leaders in terms of passenger safety, the Etios was presented with the coveted 4 Stars in Global NCAP Crash Test adult occupant safety for the year 2016.